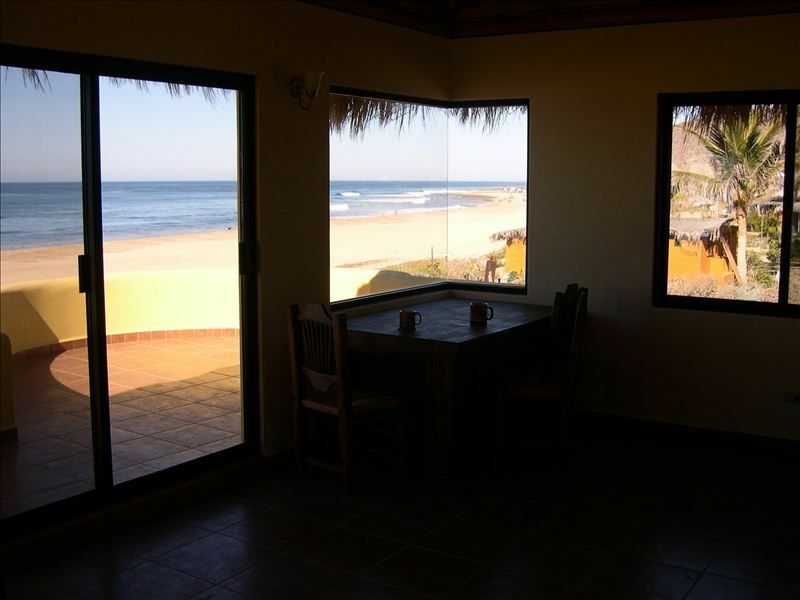 Casa Amarilla is one of the few BEACHFRONT homes overlooking the famous surf break at San Pedrito, Baja California Sur. The newly constructed Casa Amarilla offers a complete kitchen, bathroom, living and dining areas, terrazas and spectacular views of the beach, surf, and sunsets! Mexican accented tile adds to the ambiance. Besides enjoying the fun of the beach and surf right outside Casa Amarilla, the views and sounds of the surf generate a sense of place while being seen and heard from the kitchen, dining and living area.. Imagine waking up (or even washing dishes!) to an ocean view! This is Baja! The white sand beach, a leatherback turtle nesting area, extends 3 miles to the south across El Pescadero and is perfect for long walks. Just step outside to begin! When Humpback and Gray whales are migrating offshore, their spouts, flukes and occasional breaching can be seen from the beach and this beach house. This area is one of the few water-rich locales along the desert Baja coast, giving rise to native palm groves and small local Mexican farms growing basil, chilies, herbs and flowers just inland from the beach community. Nearby, the restaurant and bar of the “Rancho Pescadero”, a boutique resort/hotel, are accessible from the beach or road, a short walk (¼ mile) south of Casa Amarilla. The beach house is just a few minutes (less than 2 miles) drive from the tiendas (small grocery stores), taco stands, restaurants, gas station, and a sports bar in the community of El Pescadero. The historic town of Todos Santos, designated as a “Pueblo Magico” is just a 10 minute drive north, and offers a variety of restaurants, great taco stands, tiendas, craft shops, banks, and art galleries, all within walking distance of its church and plaza. Or, load Casa Amarillas beach umbrella, beach chairs, and cooler into your car and head for Los Cerritos Beach, just a 7 minute drive south of Casa Amarilla, a family friendly swimming beach with lifeguards, surfboard rentals, and a beachside restaurant/bar. Of course, all the activities of cruise ship destination Cabo San Lucas are about a half hour's drive south. See the San Pedrito surf point, migrating whales, pelicans, osprey, and frigate birds. Step directly down to the beach! View the rugged Sierra de la Laguna mountains to the east. Includes convection oven, coffee machine, blender. approach to vacation rental -- without a lot of property management apps and calls and fussing around. Brian offers a comfortable, well-appointed surfer pad at a spectacular location overlooking the surf break, in a straight forward, non-corporate manner. You can relax and be human, and commune with nature. It's refreshing and wonderful. We'll be back. Lovely view and balcony overlooking the beach! We stayed in the downstairs unit and it was fantastic. Everything was neat an clean when we arrived, and the owner, Brian, made us feel right at home. Because it was right on the beach, you could check out the surf from the dining room window! The surf spot was just a short walk up the beach. I highly recommend Casa Amarilla. Wonderful house! Beautiful location! Excellent host! From the moment we stepped through the back garden and up to our suite, we were delighted. The suite had everything we needed for our stay with four adults. We spent most of our time out on the balcony or down on the beach, watching the whales breach and blow and enjoying the surfers each morning. The sunsets were beautiful. Ideally located for day trips, we enjoyed Todos Santos, El Triunfo, San Lucas, San Jose, and La Paz while we were there. Having the host nearby was helpful, especially for first-time visitors. Great visit to the Baja! Casa Amarilla is a great beach front property, located on a perfect spot on the beach just steps away from an area that is safe for swimming. The beach itself is beautiful and great for walking. From the balcony we saw endless streams of migrating whales, and evening sunsets were spectacular. The apartment is simple and comfortable (although I would love to see a small microwave added to the kitchen)! Brian is a very pleasant host, providing all that you need for a beach vacation. We stayed here because the place we usually stay next door osprey nest is no longer available. We have been coming to el pescadero for around 12 years but always stayed in Osprey. I would say that casa amarilla is roughly equivalent to Osprey. Brian was a good host. Nearby Gypsy Tours offers Coastal Mountain Hiking, Panga Boat Fishing, Horseback riding, and tours to El Triungo and the Piano Museo (ask for contact information). Its an easy day trip to surfing lessons at El Cerritos Beach, ATV rentals in the desert, golf in La Paz and Cabo San Lucas, great coral reef snorkeling between Cabo San Lucas and San Jose del Cabo, wind surfing in the Sea of Cortez.